Four years (!) later, a new release of the vector (poker sized) playing card graphic set is nearly here. I hope to package everything up and get the release out by this weekend (5-17-15). I've finalized the main set (color, 52 cards) fixing a lot of errors (spacing, symmetry, sizing, some bad paths, etc.) and have added two new discrete jokers, one with a color variant. Every card (including the base designs for the pips/numbers) has been updated, with an emphasis in making them easier to edit (best done with the free Inkscape program or Adobe Illustrator). Several simple patterned backs have been added (in four colors) and once I convert a few of those to black and white (should be quick and easy) I should be ready to go. I have plans to add more (the mobile sized set, magician specific cards set up for gaff prototyping, etc.) but will hold off on those for now so as to not hold up the new main release. They look fantastic Chris, great work, look forward to the new release! Thanks Rich. 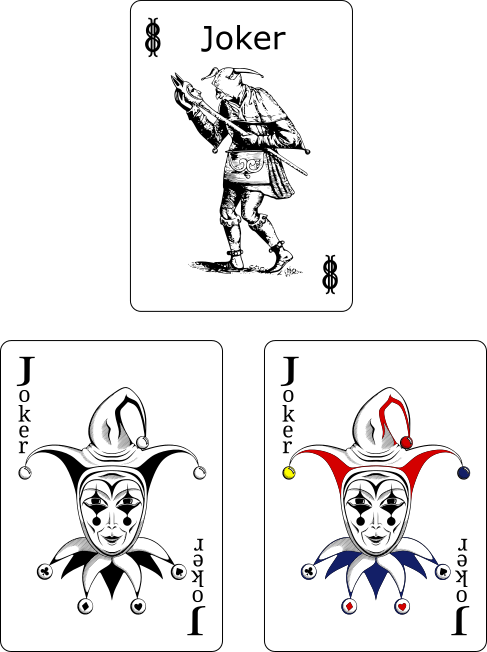 I created the first joker (based on an old woodcut) myself and another gentleman who used the card set was kind enough to donate/open source his joker (the second one) for the project. I vectorized his original art, cleaned it up and added the colorized version. Now that the base set has been updated to be easier to work with, I have some some ideas/plans for the future of the set. I suspect these items will get released with more alacrity now that I have a better base (version 2.0) to build upon. Create a version of the set specifically set up for gaff prototyping (the current layered set isn't always the best for this currently, especially the court cards) A set of sample gaffed card vectors (think split face/double enders, mis-pipped, DeLand, etc.) will be included. For doing simple edits to the set, I'm considering creating some short youtube "tutorials" on how to edit the set in Inkscape (the free program vector editing program). Take the current vectors for the #'s and characters, fill out the complete alphabet and convert that to a proper "playing card font". Offer a simplified faces set specifically designed to look better on smaller screens (think phones/tablets/etc.) I actually have a complete set here already done, but I need to do some serious updates to it. Create at least one fancy back in four colors (red,blue, green, purple) Look into creating a back that is conducive to being marked. Look into creating a few rasterized (bitmap) versions of the set in various sizes. It's probably more of a separate project, but I'm thinking about creating some version of a vectorized tarot deck. I'm always open to suggestions for things I can add to the set. Making good progress for a release tonight (5-18-15) or tomorrow. Found several last minute bugs that I'm ironing out. For those using Adobe Illustrator, the three main sets (color,B/W,Gray scale) will be available. For those using the free Inkscape editor (recommended) I've created a slew of specialized sets based on various filters. Got a good start on the "poker rankings" sheet, but that will probably have to wait until ver. 2.1. With Bob's "ten card poker deal", I really want the rankings sheet for myself. Noticed Weber using some ugly thing he obviously downloaded from the net for demoing his "Ha No Jonah" and I think I can offer something better than that.